Les Coalson: New Novel Published! My latest novel is a timely tale of environmental activists battling the power of entrenched lobbyists to hold hostage the fate of America's natural resources inheritance. You can find it as an ebook at Amazon, Barnes and Noble, ibookstore, Kobo, Baker and Taylor, Gardner's and other book outlets. The genesis of this novel was a brief AP article in the Oct 12, 2006 issue of USA Today. It was titled "Reid received $1.1M for land he hadn't owned for three years". Seems Senator Reid got paid for a Vegas land sale of property he hadn't owned for three years. Reid bought the land in 1998 for $400,000 some in partnership with a friend. He sold the land for the same price to a limited liability corporation and continued to report that he owned the land. The LLC got local officials to rezone the land and sold it in 2004 and Reid took $1.1million of the proceeds, and reported it as a personal land sale. This deal was apparently not transparent and questionable when looking at Senate ethics rules. Reid was never formally invested or questioned about the transactions. What got my attention was the backroom deals. How does an ordinary citizen with no political power or connection to elected officials by kin or other common interest preclude these kinds of deals that fatten their wallets? I mulled over this question for a few years and collected data, plot and subplots growing in my mind, while I continued to work on Color of Blood, which was released in the summer, 2008. I then started on Ransomed Earth which was completed (first draft) in March 2011, edited, sent to several readers for review and feedback, second draft done, and I began querying agents for representation. In the meantime I received an offer from a family living in Corpus Christi to write a biography of their father. I was contacted in Dec 2010, interviewed in person with the family in Jan '11, and began interviews, research, and writing about the life history of Dusty Durrill. It took a year to accomplish while still working on my novel. The end result is a 400-page (double space) biography titled, "Hi, I'm Billy Durrill, The Third Child of Clinton Glenn and Myrtle Ruhlen Durrill: a biographical sketch of William Ruhlen (Dusty) Durrill as shared with Les Coalson, 2011." This is a private manuscript for the family and is not available to the public. I continued to market Ransomed Earth and wrap up the biography into the spring of 2012. 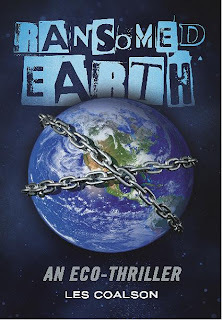 After a year of rejections I decided to self-publish Ransomed Earth as an ebook with the help of bookbaby.com. I hope you enjoy the read which incorporates environmental concerns in China and Ecuador as well as the U.S.